Ukraine’s summer capital Odessa is full of both day and night-time fun. This travel guide lists all the best things to do in Odessa, where to eat, where to drink, and where to catch a dirt-cheap opera! Known as the pearl of the Black Sea, life in Odessa revolves around the beach. During the day, locals tan at the white-sand Arcadia Beach while at night they head to the many beach clubs to experience some of Ukraine’s best nightlife. Although less lively than Lviv, Odessa offers more than a good tanning session; it’s also a cultural hub with a thriving theatre and a visible hipster influence. Make sure to get the typical Odessa photo (which we managed not to do – oops)! This impressive staircase is one of the must-see Odessa attractions – in fact, it is the city’s most famous symbol. Back in the day, the Potemkin steps were built to connect the city centre with the harbour below to make trade between the two easier. 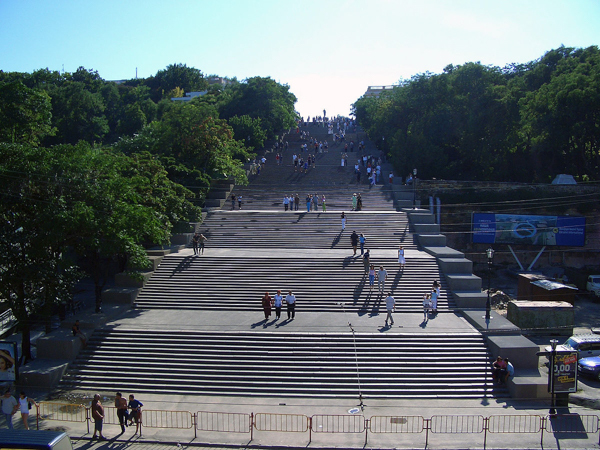 Nowadays, the steps have been taken over by strolling locals and are a good spot to do some Ukrainian people watching. With a bit of luck you might even run into a cultural event. We were in town for Odessa Day which celebrates the city’s founding and had a blast getting squished between jumping locals at a concert. Be warned, though – the Potemkin steps are tricky! When you first glance up at the staircase from below, you might think that it is definitely higher than the 27 m you’ve been told. Well, yes and no; the architect got a little creative and designed the Potemkin steps as an optical illusion. Sorry, there goes your excuse for not climbing it! Odessa’s main claim to fame is its long stretch of white-sand beaches. The best beach in Odessa is the famous Arcadia Beach which, perhaps a little optimistically, is often nicknamed the “Ibiza of Ukraine”. We probably wouldn’t go that far, but the beach is still quite nice and there are lots of things to keep you amused if you get tired of tanning. You could for instance check out the pedestrian mall at the entrance to the beach. With its carnival rides and shiny restaurants, this area feels a bit like an amusement park and makes for a fun stroll, especially at night. Welcome to the wild world of Arcadia! On the beach itself there’s plenty of bars with lounge areas and tempting bean bags in the sand. Who wouldn’t like to lie around all day, having food and drinks brought to you like you were Ukrainian royalty? If you don’t want to blow your backpacker budget (which is hard in Ukraine), there’s also people walking up and down the beach selling cold beers, ice cream and snacks at cheap prices. Entrance to Arcadia Beach is free and is an easy 40-minute bus ride from downtown Odessa. If you want to check out an Odessa beach that’s closer to the city, you should try Chkalovskiy Beach which is located between Arcadia Beach and the city. Chkalovskiy is not as nice as Arcadia, though, as there’s more shells and cigarette butts. We even saw a few people who preferred lying on the board walk than the actual sand. 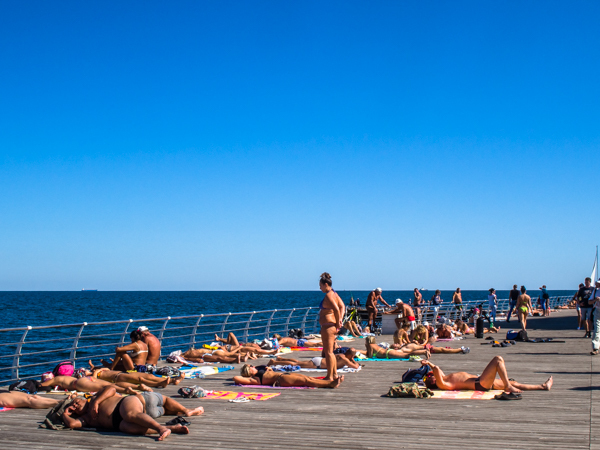 The boardwalk in front of Nemo – tanning is a popular hobby in Odessa! Apart from that it’s still a pretty decent beach with a few big hotels and beach bars around to keep you busy if you decide to stay. 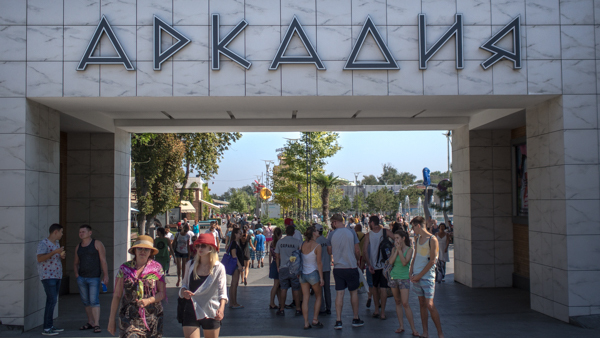 From Chkalovskiy, it’s a pleasant one-hour stroll along the board walk down to Arcadia Beach. To get to Chkalovskiy by public transport you need to get off at the bus stop at Nemo, Odessa’s giant dolphinarium. 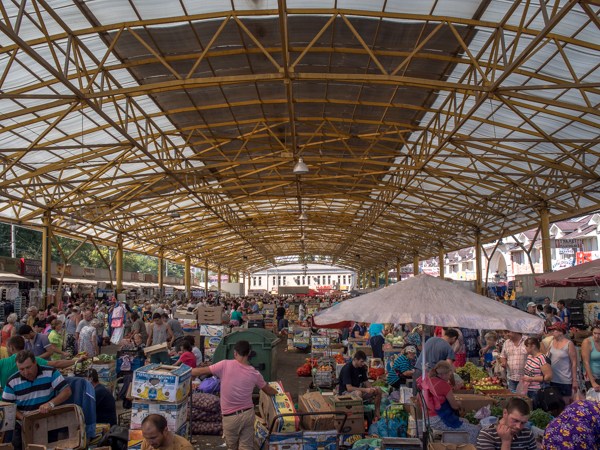 The Pryvoz Market is one of the biggest fresh food markets in Eastern Europe and no trip to Odessa is complete without a visit here. Imagine a mix between a farmers market, a Soviet shopping center and a scrap yard and you’ll have a good idea of this place. Pretty much anything is sold in this huge market where the voices of chatting elderly housewives and yelling vendors can be heard in every corner. If ingredients for a nuclear bomb aren’t on your shopping list, you can also just buy some delicious food. You can get anything from caviar, cheese and fish to traditional Ukrainian products like pickles, all perfect for a picnic at the beach. For a chill night out with drinks and food, head to the hipster and super cool food stalls at the Odessa City Fair. Finding good international food is not always easy in Ukraine, but at the Odessa City Fair you can get anything from a sushirito (a sushi roll and burrito in one!) to finger-licking good buffalo wings. For the sweet tooth there’s also a few stalls selling crepes and waffles loaded with Nutella, strawberries, chocolate sauce… Sorry, I’m drooling on the keyboard. Anyways, to accompany this feast you can get a great variety of beers and drinks, although prices are not the most backpacker-friendly in town. Eat at the fair, then buy a 2 litre plastic beer bottle for €1 from a mini market around the corner and drink it at the fair. It’s best to visit this area at night when fairy lights hang between the stalls and the tables in the street are taken up by young Ukrainians having a fun night out. Spend A Night At The Theatre! Not a particularly big fan of the fine arts? Odessa is the place to change that! With the most expensive tickets being less than €7, there’s no excuse for not treating yourself to a night at the theatre. We went to watch our first ever ballet in Odessa and ended up loving it so much that we came back to watch an opera the following night. We even got to dress up as the theatre’s dress code dictates no shorts, t-shirts, vests or beach clothes. Time to dust off that one fancy shirt that’s been stuck at the bottom of our backpacks for months! Check which functions are currently playing here and be aware that buying the tickets online doesn’t normally work. Your best bet is to just buy your tickets at the theatre the same day you want to go. 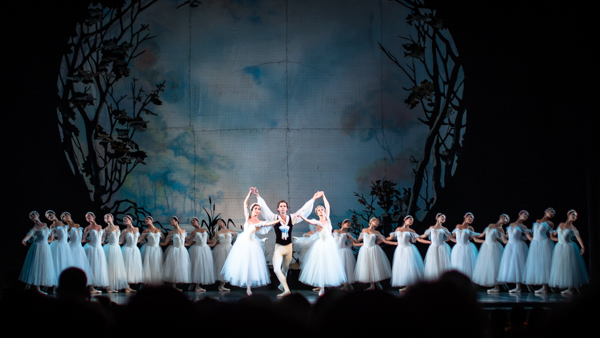 Where else in the world can you see a ballet on a backpacker budget? Sounds really interesting. My boyfriend has family there but we never made it to the Ukraine. 7 kilometer market, the outdoor military museum for WWII, the Odessa indoor Circus, are three more things I have enjoyed visiting Odessa.